There are three great ways to give the gift of Druxy’s Famous Deli! 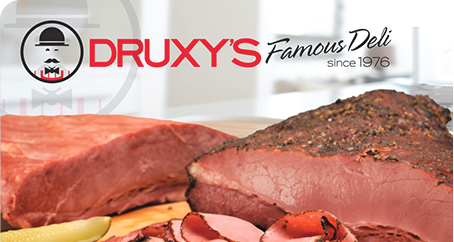 Simply stop by your local Druxy’s Famous Deli and pick up a Gift Card in person. We’ll load up the card for you and put it in a sleeve to make gift giving easy. Purchase an eGift card online and the recipient will receive it instantly via email. Choose one of our many ready-to-go designs to make gift giving easy. An online eGift card you can personalize! Upload your own photo to create a custom background – your recipient will love it! Check my gift card balance. Register your gift card to protect your balance against loss or theft. As an account holder you will also be able to view your transactions, and you’ll be the first to know about special offers and promotions. Manage your card. We strongly recommend that you register your gift card to protect your balance in case it is ever lost or stolen. Once you have registered your gift card, you can also login and view your transactions, plus you’ll receive exclusive offers as a valued member of our mailing list. Register my gift card now. Yes, you can reload your card whenever you like through the link provided at druxys.com/druxys-card. Can I have my eGift card delivered on a future date? Yes, when you place your order you’ll see the option to choose a future date for delivery. If left unchecked, your recipient will receive their eGift right away. Can I personalize the look of my eGift card? Yes, when you place your order you’ll be able to either ‘Select a Design’ (to choose from a series of pre-designed cards) or ‘Personalize’ your order. If you choose to Personalize your order you’ll be able to upload your own image to be shown on the eGift card design. With either option you will also be able to include a personal message with your order. What does "self-deliver" mean in the eGift card order form? If you choose self-deliver when you place your online order the eGift card will be sent to your address so that you can print the eGift card and present it in person to your recipient. Simply print it out and show it in-store, or show us a copy on your phone – either is fine. Just be sure to save a copy of your original eGift email in case you do not spend the whole amount in one visit. You will need to show it each time you wish to redeem. The value of your Druxy’s gift card will not be replaced if the card is lost, stolen or destroyed unless it has been registered. Druxy’s gift cards cannot be redeemed for cash. Druxy’s gift cards are non-refundable. Your Druxy’s Card may be presented for payment for food and beverages at any participating Druxy’s Famous Deli location in Ontario. There is no expiry date on Druxy’s gift cards. Use of your Druxy’s gift card constitutes acceptance of these terms and conditions. For Gift Card inquiries, please contact 1-888-4DRUXYS or comments@druxys.com.